It was something of a relief, to have a moment to extricate herself from her duties as makeshift leader of the Bellerophon's survivors -- a role she had never desired, nor, she suspected, one the crew in question would have bestowed upon her if they had been consulted in the matter. As such, convincing them of the need to comply with Captain Ives' requests had been... trying. Some among the survivors had been more difficult than others, and her own position on Ives' crew, though barely a few hours old, had soured what little goodwill she could muster among them. It was her logic, of course, that had quietened the dissenters finally; the crew were outnumbered and unarmed, in unknown space, without means to contact Starfleet or to escape. Their best chance of survival was to remain on board and behave peacefully, and any who wished to leave would be given the means to do so at the earliest convenience. None among them would cause the Theurgy trouble; for now, at least. Still, even though Hathev was now satisfied the crew were convinced of the prudence of civility, she was glad of the opportunity to leave them for a time. Her afternoon, such as it was, had been taken up by overseeing the release of the survivors and organising quarters for them aboard; there had been no one area in which to quarter them all (which she was pleased by; the opportunity for integration was appreciated, circumstantial as it was), and so she had spent much of her time simply trying to source empty cabins and assign inhabitants accordingly. It was not an arduous task by any means, but it had held little interest for her and she quickly had grown impatient with the task. There had been a meeting of the Theurgy's senior staff, or so she had heard. She had not seen the alert on her new PADD until it had already begun, and as she had surmised her presence may not have been welcome she had chosen to focus her efforts elsewhere. She had not missed the second alert, however: Acting Executive Officer Natalie Stark wished to see her at 1810hrs. The summons was not entirely unexpected but appreciated all the same, if only as another sign that the Theurgy followed standard Starfleet protocol. Hathev set out for the meeting early, unfamiliar with the ship's layout as she was. She arrived with time to spare; not wanting to disturb the Lieutenant Commander unduly, she prepared to wait until the agreed-upon time. It would give her a moment to compose herself in preparation, and to suppress the headache she could feel threatening behind her eyes. It seemed today she had moved all-too-swiftly from one tense diplomatic battle of wits to the next; she could only hope the Commander was as tired as she. The meeting wrapped up, on time, just before 1800 hrs. She had roughly 15 minutes or so to get to her office from the Conference lounge. Both were on the same deck, and it wasn't a terribly long walk by any means. She simply had to exit the Conference lounge, and take a left. The hall would dead end at her office. The walk would take less than thirty seconds. Given that short distance, Natalie did not immediately leave the lounge. She took her time, after the others had exited, to stretch, and recycle her mostly empty cup from before. This she replaced with a small glass of chilled water that was swiftly ingested. She debated a trip to the head - which would in turn be a trip to her office - and decided she was fine for the moment. She glanced out the view port, taking in the sight of stars moving along at warp, and not the muted blues of the Azure Nebula, and breathed out a long, low sigh. Natalie was glad to be rid of the Nebula, at least. Away from the Borg, and the dead zone that had resulted from the sacrifice of Wenn Cinn and the detonation of an Omega Device. Whatever that was, she thought to herself. She'd chanced a search on the ships computers, after she was officially logged in as acting XO by the Captain. That had been a dead end. What little she knew was simple conjecture at this point. The 'device' clearly contained some kind of highly volatile particle that, if mishandled would result in a subspace dead zone of enormous proportions, rendering FLT travel impossible across its boundaries. Shaking her head, Natalie pulled her thoughts away from what had happened, and toward what needed to happen next. She had a meeting with one Lieutenant Commander Hathev. The Vulcan was the former Chief Counselor , of the late USS Bellerophon, and according to her own meeting with Captain Ives, had assented to assume the same roles and responsibilities on the Theurgy. As First Officer, it was now Natalie's responsibility to see that Hathev whatever she needed to make this transfer (within reason) work, and provide suggestions and feedback on staffing her department. As well as getting a feel for how the integration of the survivors from the Bellerophon and the Dauntless was fairing. If she were being honest, she knew she should have left for her office the moment this meeting ended. But she was avoiding the place, given that she felt like it was someone else's office. Namely, Carrigan Trent. And that's a Can of Worms you really don't have the time to go into right now Natalie. Finish your water and go do your job. Yes, her inner voice was growing more and more caustic as the day went on. Duly chastised, she cleaned up what was left in the room, and then tucked her PADD Under her arm, and exited in the access corridor. She took two steps to the left, and looked up, blinking in surprise. She hazarded a quick glance at her PADD, confirming the time, and then back up at the short woman standing in front of the Office Door. Female. Vulcan. Teal undershirt. Yeah. That'd be Hathev, she concluded. Vulcan's are usually so punctual. I figure'd she'd show up precisely on time. Damn. Nothing else for it. Putting a smile on her face, Natalie walked a bit straighter, legs kicking up her skirt just a bit with her increased pace of stride. She closed what little distance remained, and called out, "Commander Hathev? I'm Natalie Stark. I hope I didn't keep you waiting too long. My other meeting just wrapped up down the hall in the Conference Lounge." Nat did not offer the other woman her hand. The acting XO had known a few Vulcan's in her time, and unlike the Romulan she'd roomed with at the Academy, the Vulcan's were not, as a general rule, a casually tactile species. Most preferred their native salute, if any gesture was to be given in a greeting or departure, but Natalie would allow the officer in question to initiate such an action. She was never quite sure when it was appropriate, and as with not offering her own hand, she was at least trying to respect general Vulcan cultural norms. Under normal circumstances, Hathev would have examined the Lieutenant Commander's personnel file before such a meeting. She disliked entering into any situation without full preparation, especially a situation as delicate as this had the potential to be. She had been at a disadvantage in her meeting with Captain Ives, and although that was to be expected, she would have preferred to attend this appointment with more information at her disposal. Accordingly, she had requested the necessary permissions to access the crew's personnel files -- a facility she would also need to perform her new duties aboard the ship. Such concerns had clearly not been a priority, for obvious reasons, and by the time she had received access to the information she had time for only a cursory glance before setting out for the meeting. It had been little more than an overview, but what Hathev had read in Stark's file told of a dedicated officer in the Operations department with what seemed like a deceptively quiet career before the Theurgy fled Earth. A pity she had not the time for further studies; but then, after the revelations of today she trusted there was little left that could surprise her. That being said, the Acting Executive Officer who came down the hallway, hailing Hathev as she approached, was considerably younger than expected. Natalie Stark was only a little taller than Hathev herself and had almost Vulcan colouring, a strong profile and a youthful aspect to her countenance. Despite this her demeanour belied her tender age, and though she carried herself with what might best be classed as determination rather than confidence or authority, the effect was much the same. This was a young woman who had steeled herself in preparation for performing her duties, duties that had been thrust upon her and were not, perhaps, in line with her preferences and nature. A noble resolution, and one Hathev could not only respect but sympathise with. 'Not at all, Commander, it was I who was early.' She stepped forward smoothly, offering Stark a handshake. Not her preferred method of greeting, admittedly, but she had found it could put more touch-responsive species at ease. Still, she appreciated that the Commander had left it to her to initiate such contact. Natalie would have been pleased to know that she had made what appeared to be an initially good first impression with the Vulcan counselor. And while she might not have been exactly surprised by just how well the pointed eared woman was able to discern what was going on beneath the surface of Natalie's demeanor, she would have been unnerved to know that she could be so easily read. Never mind that this woman was about 4 times as old as Natalie, and had a lifetime of experience in reading and discerning the mental and emotional state of sentient beings that she served with. To her visible surprise, the Vulcan woman offered Natalie a very human hand shake. A small smile played across the Martian's lips as she reached out and took the offered hand, giving it a few firm pumps before letting go. It appeared that both women desired to be cordial to one another, and as accommodating as possible. Off to a good start then, I suppose, she thought to herself as she let out a sigh, the smile staying in place. "It's perfectly fine, Commander," she said. "Or do you prefer Counselor? I know it varies from officer to officer." This would be Natalie's first chance to learn something about this woman beyond her own brief reading of the Vulcan's personnel file. "Honestly, all I would be doing in there is taking a moment to go over your file again and try and switch mental tracks from the meeting I was just in, to the meeting with you. Funnily enough, simply talking to you is helping to make that transition, so by all means, I'm perfectly willing to begin now. No time like the present?" One the diminutive Vulcan had given her assent, Natalie nodded and tucked one hand behind her back, and gestured along the hall with the other. "I am well aware that these are far from normal circumstances. Captain Ives informed me that you have indeed agreed to provide your services to the crew. I wanted to help answer any questions you might have about our circumstances that the Captain was unable to do so, as well as hear for myself how yourself, and the other...survivors are doing." At this, her voice fell slightly, remorse tingling her tone. While she had not been responsible for the destruction of the Bellerophon having arrived just after the fact, the whole crew bore a sense of guilt for the actions that had happened. Swallowing a bit, she continued,"To that end, I thought we might take a walk about the ship, esqueing the more traditional form of one on one meeting for something that might be a bit more visually informative?" It was too early to make any kind of judgement on the Acting Executive Officer, but from preliminary data it seemed the woman was considerate and pragmatic; traits Hathev could appreciate in a commanding officer. She exhibited the same control of her faculties that her captain had shown, and Hathev thought wryly back to her original assumptions about this ship and her crew. She had not been aboard more than a few hours and already her initial conclusions were disproved and distant. It seemed Stark's forethought in allowing Hathev to dictate the form of greeting extended to her form of address; Hathev nodded slightly in appreciation as she confirmed her preference: 'Counsellor is fine, thank you.' She had been a professor longer than a commander, and her rank, though important to her, had never been her chosen method of self-definition. Stark's suggestion of their meeting being a more perambulatory than sedentary affair was unorthodox, and not one Hathev would have made herself. She preferred a controlled environment in which to study her subjects, but perhaps Stark did not feel she had the luxury of such an option, or perhaps she was simply more inclined towards the practical than the interrogatory. Whatever the case, she could not fault the logic in being offered a tour of sorts, and was content to agree. She fell into step beside the Acting Executive Officer, examining her as they walked. She had not missed the Commander's tone when she mentioned the Bellerophon's crew; she exhibited the same markers of regret and even responsibility that Captain Ives had shown. 'Your accommodation is appreciated, Commander,' Hathev said. 'I am fully aware that my appointment to this position may be more than a little controversial, within both your own crew and what remains of mine. It is not a position I would ever have imagined myself accepting mere hours ago, and yet it seems my discussion with Captain Ives was revealing, in more ways than one.' She had been ready to die rather than betray the Federation. Now, it seemed she may have done so without even realising; certainly she had betrayed the ideals of the Federation, the heart it had built itself around. A small crime compared to the destruction of the Bellerophon, perhaps; but she did not wish to live in a world where small crimes were forgiven simply by virtue of their favourable comparison to worse atrocities. She let out a quiet sigh. It truly had been a day of unconscionable length. It was a given that both women would likely want to be on their best behavior. At least, this was the assumption that Natalie was operating under as she spoke with the Counselor, late of the Bellerophon. Though the brunette had to allow for the possibility that, as a Vulcan, Counselor Hathev - she was making an effort to think of her by her title instead of her rank now, as per the woman's stated preference - was always on her best behavior. When was the last time you saw a Vulcan that wasn't? She asked herself the rhetorical question. As they walked, Hathev addressed the concerns that Natalie had brought up, and the brunette forced herself to focus on the words of the Vulcan, and not on her own lingering sense of guilt. This was not as hard as she had expected, and she was a bit surprised. It seemed the shorter woman had the kind of voice that - if not commanded attention, enticed it. They'd made it around the Conference Lounge and to the turbolifts, which parted open shortly after Natalie pressed the call button, before the Acting XO spoke again. She almost didn't speak at all, because unless her eyes were mistaken, the Vulcan had allowed herself a small smile. Natalie failed to keep her surprise entirely hidden - her eyebrows shout up high on her forehead, and would have been hidden in any bangs if she hadn't left her hair back in a pony tail after the meeting in the lounge. Today had been an exercise in practicality, and as much as Nat loved having her hair down, she needed it out of her face if she were going to be all over the ship. "I appreciate your frankness on the matter, Counselor. I think our best chance for the future is to take this one step at a time. One foot in front of the other. Not forgetting how we got here, as you said but...focusing on the underlying circumstances that compel us to work together. So that there will be less of these unfortunate encounters in the future. At least...I'd like there to be less." The smile that accompanied her words did not meet her eyes. It was a hollow one. Natalie was not a fool. As much as she, and Captain Ives, wanted to be better, she knew that circumstances would likely ensure that the Bellerophon was not the last ship destroyed in the attempt to rid Starfleet - and the powers of the Quadrant - of their infestation. Still, she gestured to the lift, and followed the Vulcan inside. "Lets start with....Deck 6," she called out to the lift, as it started to decend, and then she turned back to the Teal collared Vulcan. 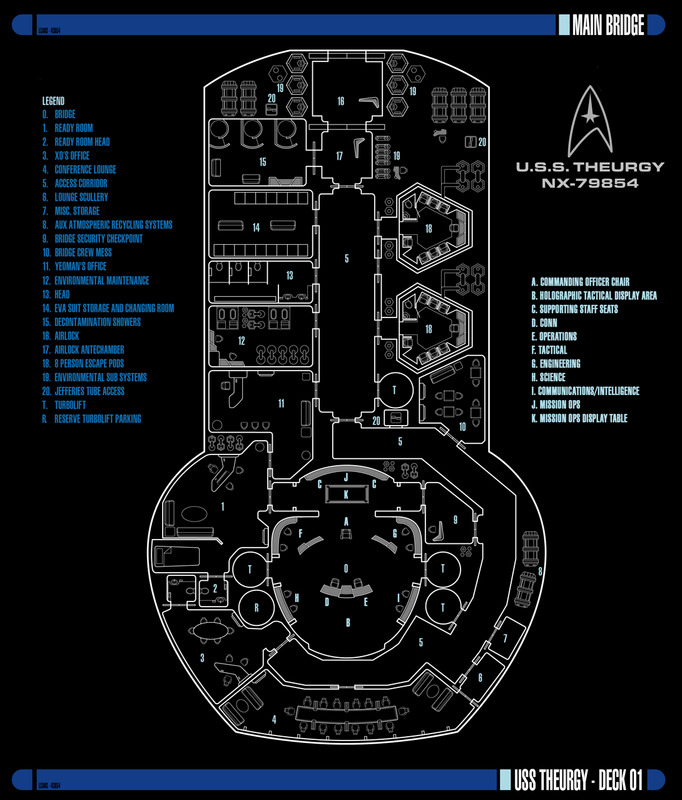 "Deck six is the first deck in which we have some recreational facilities, as well as the first deck where we can begin to cross between vectors," she explained, slowly making a map in her mind of where she might want to take the woman on this tour. She smiled and continued on through the short ride. "I'm not sure how much animosity you'll find among our crew toward the survivors. You're more likely to find guilt, I think. Save perhaps from those that lost someone close to them. Unlike our fellow officers on other ships in the fleet, we understand that, for the most part, these people are just following their orders. They see us as heinous traitors to the Federation," and God do those words still hurt, she thought, pain flashing across her features, "While we - mostly, and this is just based on my observations - see them as misguided and forced to fight. That they hate us all the more doesn't make it easy but....well," she gave a little shrug. Coughing a bit, the doors parted, and Natalie lead the way down the corridor, past a few repair teams, toward the Upper Gymnasium. Walking and talking, she added, "If you find yourself struggling to adapt, or simply searching for a perspective on this, I would suggest scheduling some time with Lt. Commander Vivian Martin. She came off of the Resolve quite recently, stepping into the role of Chief of Sciences. She may have some insight there.". Those that had come of the Harbinger had for the most part not been senior staff material. And had sparked a mutiny, even though they were misguided - or mind controlled. "Through here we have the primary gymnasium for Vector 01. Its one of the chief recreational facilities for the ship. This deck also houses Engineering facilities for both the Helmet's and the Sword, Auxiliary warp cores, and the public baths, though the latter is on Vector 02." Stark's surprise had not been lost on Hathev; interesting. Hathev did not emote extensively, of course, but she would use expression in moderation if it served a purpose: primarily to put those around her at ease, telegraphing her intentions towards them in a way their species could more naturally parse. It seemed in this case she had not achieved the intended effect; a pity, but useful data for future interaction. The Commander's words were only partially reassuring, accepting of the possibility of future casualties as they were. While Hathev believed the other woman's expression of hope, her exhibition of guilt, to be genuine, such sentiments alone carried little weight. There also must be a resolution to avoid any further Starfleet casualties, including those on board the Theurgy, at any cost. Hathev was no fool, she knew death was sometimes inevitable, knew that in circumstances such as these there were often no good outcomes, knew, even, that tragic events could be caused by simple error. Perhaps Stark's words were wise in their acknowledgement of this future possibility. Perhaps Hathev had spent too long inside a classroom, and forgotten the realities of the world. Still. She would deal with such a situation on the occasion it arose, and not before. In the meantime, she would do all in her power to avoid it ever being a quandry to contend with. They reached the end of the corridor, and entered the turbolift. Stark's assessment of the crew's feelings towards those from the Bellerophon was unexpected: considering the history of the two ships, Hathev had anticipated much greater resistance from the Theurgy's crew than Stark seemed to attribute to them. It seemed Hathev had once again done them a disservice. There was more that could be said on that subject. Certainly it would be useful to discuss at some point, especially as it may lend insight into the future deprogramming of other misled Starfleet personnel. In the meantime, however, there was a more pertinent matter she wished to raise. 'I wonder if I may make a suggestion. There were many lives lost in the battle between our vessels, and additional losses since. Those from the Bellerophon would appreciate the opportunity to hold a ceremony to honour the dead, and I am sure the same is true for those from the Theurgy also. There may be merit in allowing both crews to grive alongside one another. I hope you would allow me to offer my services in arranging such a gathering.' She was beginning to understand the extremes of mental and emotional turmoil the denizens of the Theurgy must be experiencing; this, at least, may be a first step towards alleviating that stress and beginning the process of healing, for both their crews. The turbolift arrived at its destination, and the two women disembarked. It seemed Hathev's orientation was to begin in earnest; she was glad of it, the chance to familiarise herself with her surroundings was one she appreciated. Even apart from the ship's current circumstances, the Theurgy was like no other vessel she had served on, with its multi-vector design and ability to function even when separated. She had little knowledge of starship architecture, preferring to study the architecture of the mind, but it seemed to her layman's understanding that the Theurgy's design was either a masterful feat of engineering or an enormous exercise in redundancy. Of course, it was entirely possible the two options were not mutually exclusive. Natalie mulled over the idea of a ceremony that involved the crews of the Bellerophon and by extension, the Dauntless, and the mixing of this with the crew of the Theurgy, as they acknowledged their own not insignificant losses. At that point it would seem wise to extend the offer to the crew of the Endeavour, as well as the Cayuga. She would seek out Vanya and get a feel from her as to if that would be acceptable. She imagined however, given their conversation earlier that day in Trent's - no, her - office, that the Romulan would find this a reasonable idea. The ops chief felt her cheeks color as she remembered the direction that earlier conversation had gone, and quickly set such thoughts aside. Now was not the time, and one of the 'skills' that Natalie had been developing was the ability to compartmentalize. It didn't always work the way the Martian wanted, and it might not be the most healthy of coping mechanisms for stress, or for focus, but it was something she was using more and more. The broader implications of that earlier chat would have to wait, for now. Aloud, all she committed to was, "I will broach the subject with Captain Ives, passing along that the suggestion comes from you, and add my own recommendations as well. I know we have a few plans ahead for how to mark and honor the passing of those lost to us." A part of her could not help but wonder, as the tour moved on, if the crew of the Bellerophon would even want to mourn alongside those that had killed their shipmates and loved ones. Leading Hathev past the gym, and around toward the baths - because these were a truly unique feature that had been added to the vessel as a result of it's size, as well as its occasional diplomatic profile - Natalie pondered the woman's next question. They passed through a set of doors within the hallway that were double thick - these would be locked when the Vectors separated, sealed up tight as outer bulkheads. But in SOM (Standard Operating Mode) they functioned just like any other door. Natalie took a moment to point this out to the Counselor, and then addressed her specific question. "It's an interesting case, in truth," Natalie said, as confidence seemed to well in her tone. Her expression brightened somewhat as she warmed to a topic in her area of expertise. "In general, the Theurgy is designed to operate as one united vehicle. We call this Standard Operating Mode, or SOM for short. In truth we hardly ever mention it, as this is the normal cruising configuration for our ship. In situations like that, the bridges on Vector 02 - The Sword, and Vector 03 - The Stallion, as they are referred to when they are in independent flight mode - those stations are unmanned. "In a combat situation, for the most part, we might staff the bridges there with auxiliary personnel in case a need arises, and ideally the departments would have the manpower to cover that with little issue." This, of course, assumed that the ship was operating with a fully staffed crew at any given time. The Theurgy couldn't exactly claim that. "And this would also apply to the auxiliary engineering rooms for each vector, though those are more frequently staffed as we often draw power from the three warp cores even when in SOM. Multi-Vector Assault Mode - MVAM, for short - is highly automated, with most commands coming from the main bridge on Vector 01 (The Helmet). It's only in the....ideally rare occasions that truly Independent Flight Modes have been called for that we fully staff each vector, replicating the structure of a separate ship." Natalie let out a soft sigh as they entered the baths, pausing to let the Vulcan take in her surroundings. In a slightly less enthusiastic tone, she finished with, "These past few days are the only times that the Vectors have operated in a truly independent fashion for any appreciable amount of time, in so far as I can remember. As for staffing....it should be reflected as you stated. However....losses have made that difficult. One of the major points in my previous meeting, before I found you, was to get the current heads to give me a full accounting of their departments, and what gaps are missing in the chain of command. There should be enough to fully staff each vector in time of need and....and we're not there yet." There was no small amount of risk inherent in Hathev's suggestion to gather the Theurgy and Bellerophon crews together to mourn; it would have been far worse, however, to suggest the Bellerophon survivors grieve alone. Such a gathering would be only a few inflammatory words away from igniting violence against the crew of the Theurgy, violence that would serve no one. Segregation would cause more problems than it might solve. Despite the precariousness of her position as the survivors' leader, Hathev was confident she could present the suggestion to them in such a way that they would be inclined to co-operate. Any additional integration that could be achieved between now and then would serve to assist her in that endeavour. Commander Stark paused as they passed through a set of doors, demonstrating their unusual sturdiness for an internal aperture. Hathev had to wonder what possible application the ship's design could have outside of the most specific of situations; she had to assume that under most circumstances the ship simply operated as a single entity, in which case would the additional machinery and manpower needed for independent operation not be a hindrance? But then, some of the prototypes that had come out of the Starship Design Bureau had been truly preposterous in their unbridled optimism and ambition. And of course, a slightly circuitous starship design was hardly the most implausible thing she had come across today. No; there was little purpose in questioning this further. She need only accept, and consider how the unique design might affect the running of her department. She had not realised personnel was so short; the ship had acquitted itself admirably against the Borg, a feat which could hardly have been achieved on the skeleton crew Stark seemed to be describing. Heavy losses during such an engagement were to be expected, of course; however either the Theurgy had been operating at sub-optimal capacity before the battle, or they had sustained even greater losses than Hathev had imagined. Of course, none to compare with the comprehensive destruction of the Bellerophon and the loss of the vast majority of her crew. 'You have my condolences,' she said, offering Stark a tight nod. She was not insincere; any loss of Federation life was a tragedy. And yet she would not pretend to mourn the likes of Mr Marquez. There were more deserving outlets for her attention, her new position chief among them. Focus on the matter at hand. So Natalie redirected her thoughts to the Counseling department aboard the USS Theurgy. She marshalled her thoughts and decided that she would take her fellow Lieutenant Commander past one of the officers for that department, two decks down and back on the first Vector. "I will point out that the recreational facilities on the Theurgy do include these public baths. I highly recommend visiting them at least once, but they aren't really germain to your question. Unless you favor a pool or a warm tub for counseling sessions. If you'll follow me?" She asked, though she knew that Hathev would follow. They turned down the hall, headed toward a different lift that would take them to Deck 08. "I did not have much interaction with Dr. Hayden O'Connor, the previous Chief of Counseling. By all regards she was relatively competent at her job, after joining the crew following our encounter with the USS Harbinger. However, I know that Captain Ives had cause to relieve her of her duties. I...do not know the specifics. Those were sealed records that until ....today, I guess, I did not have access to. I haven't gone to check them, frankly, because the officer in question perished some time after, while serving in a lesser capacity." She gave an apologetic shrug. "We...have had a lot of turn over. Dr. O'Connor replaced a man name Garen Niels, whom also perished in the line of duty. He became our chief counselor shortly after we began our current plight. The woman that we had in charge of the department turned out to be a spy for Starfleet Intelligence. Commander Rez had....a few positions on the ship. She was the first Chief Counselor during my tour. However it was Niels that I had personally had a few sessions with. The usual mandated sort of thing, before everything went to hell in a handbasket." It was clear that Natalie was glossing over her own sessions with Niels. The man had been helping her with her anxiety and a few other issues that....that the necessities of command had forced her to come to terms with. I wonder what he would think of me now? she asked herself, shaking her head as they entered the turbolift. "Deck 8, forward section," she ordered, as the lift kicked into action. "He was a good man. I'll admit that I miss him. I wish I could say the same about Dr. O'Connor but I never got to really know her. That said, the current acting Chief Counselor, Lt. (jg) Zelosa Ejek, came to us from the Resolve. I have nothing but praise for her, though this comes from the woman stepping up into the role of First Officer during our most recent Independent Flight operations as part of what Captain Ives dubbed the Continuance Protocols we executed after our disastrous first contact with the Savi." She pulled a face at that and did her best to struggle to repress negative emotions. She was well aware of the turmoil the Savi were putting up with now in the wake of certain revelations, and while she found almost all of their conduct reprehensible, she was also aware that they too were victims of the infestation crawling across the galaxy. This did not make it easy to forgive or forget what had happened, of course. Natalie was only human. The lift opened, and Natalie stepped out. "Lt. Ejek is holding down the fort at the moment as the acting department head. If you want my advice, for whatever it is worth, I would suggest her as an Assistant Chief. In addition to being a good listener, I have found her to be adept at organization and coordination, skills required for such a position. She's not perfect, of course," Natalie was thinking of the woman's disdain for a certain junior security officer, "But she showed promise. Ah, here we are." The slightly taller woman came to a stop and gestured to a set of double doors. They were currently locked and not in use. They listed "Counseling Department Offices - Vector 01". "In their infinite wisdom, the ships designers provisioned offices for your department on each of the three vectors, with the primary offices being housed in Main Sickaby. This is the small suite available to Vector 01, which we crossed back over to during our turbolift transit." It would seem that the position Hathev had inherited was something of a poisoned chalice; hardly unexpected, considering the circumstances, yet it was still disconcerting to hear quite how many individuals had occupied the role in the few months since the Theurgy's flight from Earth. That both of her predecessors had perished, in such a short time... The exact circumstances would necessitate further investigation at a more suitable time. She would not be sharing their fate. Even aside from the personal implications for her own safety, it was concerning to hear the department had suffered such little continuity of command. Considering it must be in what she could only assume was extreme demand, she could hardly expect it to be in ideal condition; no doubt this had contributed to the emotional turmoil she had witnessed in Cir'Cie and which she could be certain extended to the other officers aboard, if the behaviour of one Mr Trent was any indication. With that said, however, she had never shied from a challenge. She had accepted this position in the full knowledge that it was, to put it lightly, less than ideal; all that remained was to acquit herself to the best of her abilities. Stark's reticence to detail her own experiences within the Counselling department was noticed but not judged; Hathev would expect little else, such details being both confidential and irrelevant to the matter at hand. The only aspect of it worth remarking upon was the implication that the Commander had not visited a counsellor since Mr Niels. If that was correct, Stark was exhibiting remarkable self-composure considering the current circumstances and her own lack of support; but that did not mean she would continue at her current level of stability indefinitely. As Stark had seemed uncomfortable discussing the matter, brushing past quickly with euphemism and light humour, Hathev deduced any comment of her own she might make on the subject would be unwelcome at this time, and so she refrained accordingly. However it was a detail she would keep in mind; perhaps it would be prudent to recommend mandatory sessions with any senior staff who had not recently seen a counsellor. More consideration was required, certainly. They disembarked the turbolift at Deck 08, Hathev beginning to fill in the blueprints of the vessel in her head. She was grateful that the acting First Officer had seen fit to spare the time to induct her so thoroughly; simply studying the schematics would have afforded her the same knowledge, though in a far less efficient manner.